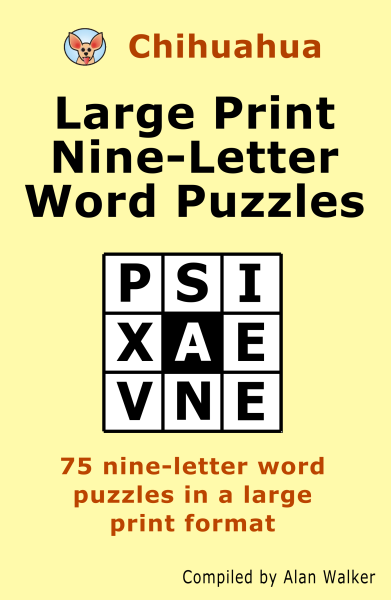 Large print Chihuahua puzzle books, containing challenging nine-letter word-finding puzzles. 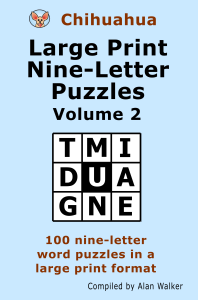 Volume 1 has 75 puzzles; Volume 2 has 100. 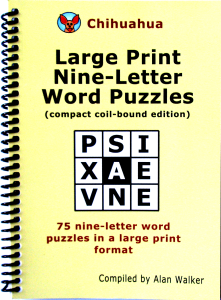 The book uses well spaced 16 point type for all text, including puzzle targets and solutions. See how many words of at least four letters you can make from an array of nine letters. The letter in the middle must be used in every word, and at least one word can be made that uses all the letters. All possible words are listed in the Solution section. Available in two sizes, only from Lulu.com.